As the Upper East Region approaches the hot season, the Regional Commander of the Ghana National Fire Service, Heroine S. Boakye, has called on the public to be very careful about how they handle fire both at home and at workplaces. She has also asked private and public institutions to put in place both fire preventive and control measures to protect their investments in the event of any fire outbreak. She also wants families at home and management of institutions to start examining their electrical installations to ensure that they are intact and good enough to stand the effect of the heat the season will bring. 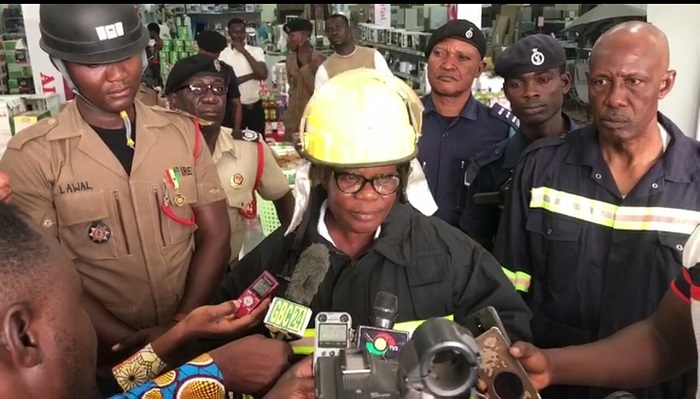 Mrs. Boakye gave the advice in an interview after a fire disaster simulation exercise by her outfit at the Bolgatanga new market to test the preparedness of its personnel and equipment ahead of any disaster. Besides, the exercise was aimed at assuring the public that the service is capable of handling fire outbreaks. The Upper East Regional Fire Service Commander was worried that a large number of buildings in the Bolgatanga Municipality do not meet fire safety standards and flout safety regulations and yet were allowed to spring up for people to occupy. Another worry is the fact that due to the unplanned nature of many suburbs of the Bolgatanga Municipality, there are very little access routes to some areas and would be difficult to fight fire in these areas in the event of an outbreak. Mrs. Boakye has called for a renewed collaboration with all district and municipal assemblies and the Environmental Protection Agency (EPA) where the assemblies and the EPA will consult the Ghana National Fire Service before issuing building permits across the Upper East Region. According to her, the service has a duty to sensitize the public to fire safety measures and also fight fire outbreaks in the event that they come up. She stressed that putting the safety measures into practice at home and workplaces is the responsibility of the owners and managers. She urged the Bolgatanga Municipal Assembly to be bold to decongest the markets in Bolgatanga and some suburbs to create access routes for easy movement of vehicles for easy and faster evacuation and to fight fire in the event that an outbreak occurs. The new Melcom building was one of the sites for the stimulation.